Project obstacles and solutions: Jeptha Creed is a family-owned micro-distillery in Shelbyville, Kentucky. In 2015, the Nethery family announced their intention to build a 15,000 square foot distillery that would be a destination on Kentucky's bourbon trail. The distillery sits on a 64-acre farm owned by the family. Taking advantage of their own heirloom corn crops, the distillery produces three different bourbon whiskies from locally grown ingredients. The distillery was designed to accommodate small groups of visitors to the site. The concrete used throughout the distillery had to be both durable and pleasing to the eye. This included an outdoor tasting patio. The patio slab was poured with a red colored concrete that was broom finished. This color was chosen for its compliment of the redwood finish of the building. The colored concrete was used on the walkways that wrapped around the exterior of the building to the front entryway. IMI supplied integrally mixed colored concrete for these areas. Dee and Shane Whitaker finished all of the colored concrete. IMI did extensive tests with the Whitakers and the Nethery family to produce a color that was acceptable to them. The production area floor was poured with a 4,000 psi mix that was polished to a fine finish. Phillip Osbourne Concrete finished the interior slabs. These also were designed with visitors in mind, with wide areas where groups could walk and see the mash being distilled. 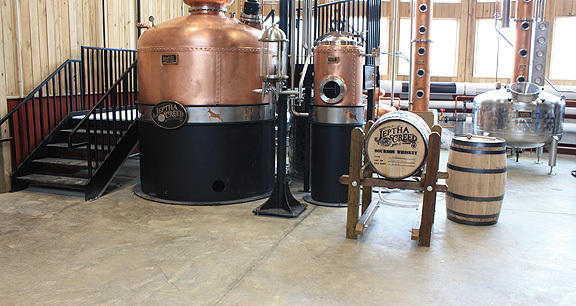 The Jeptha Creed Distillery opened its doors for visitors on November 11, 2016. They are expecting 11,000 visitors per year. For more information on colored concrete, click here. For more information on mixes used for finished flooring, contact the sales representative for the concrete plant nearest your location, click here.